In orthodox Christianity Jesus is regarded as the Divine Son and Second Person of the Trinity; nothing less than God. Theologians – referring to those who presume to speak authoritatively about God (logos, the study of or talk about theos, god) – have ensconced him fully inside their doctrinal systems. Over the centuries believers have witnessed to direct encounters with Jesus himself, but theologians are typically cautious when it comes to validating their authenticity. How can you recognize someone you’ve never met? This point should not be dismissed too quickly. None of us today has a personal memory of meeting the historical Jesus, so the recognition must be based on popular depictions (like the gorgeous wavy-haired European Jesus in a Warner Sallman painting) or a conception more symptomatic of our individual and cultural biases. Maybe you saw the scars in his hands and feet. But then again, thousands in history besides Jesus have been crucified, so how can you know for sure? The Jesus of orthodox theology is not the same Jesus who came from Nazareth, who lived and died in the first century. Archaeologists and historians are more helpful when it comes to clarifying our picture of what that Jesus may have been like. But what about the New Testament Gospels? An internal comparison of the narratives themselves shows them to be more myth than history. I don’t mean this as an excuse to ignore what they have to say or relegate them to nothing more than Palestinian fairy tales. These Gospel narratives were composed after the death of Jesus but before the dogma-machine of Christian orthodoxy got underway. They are not exercises in theology as much as productions in mythology, stories told as meditations on Jesus as a symbol of God. Not Jesus as God as later theologians would insist, but on Jesus as a threshold figure linking the realm of everyday life to the present mystery of reality, beyond names and forms. Not one of the New Testament authors had known Jesus personally. The traditional appellations of “Matthew” (a disciple of Jesus) “Mark” (an assistant of the apostle Paul) “Luke” (a disciple and biographer of Paul) and “John” (another disciple of Jesus) were added later. Their contribution was to collect and invent stories that featured Jesus as one who mediated for others an experience of spirit, but who could now only be remembered, not encountered. Even Paul, writing perhaps 15 to 20 years prior to the earliest Gospel (Mark c. 70 CE), had never met the historical Jesus. Since they lived in closer proximity in time and place to where Jesus had been alive, the New Testament storytellers could depict him with greater realism than can a twenty-first century North American believer. Consequently those stories have seemed more like historical accounts to us than sacred fiction. Add to that our modern prejudice against fiction generally, which regards it as more fantasy than truth, and it’s no wonder that so many Christians (and others) read the Gospels as history. This gives me an opportunity to reach back to a couple recent posts in this blog of mine, published under the general title “Idols of Orthodoxy.” There I offered a way of interpreting symbols – not mathematical or roadside symbols, but specifically symbolic objects like national flags, wedding rings, religious icons, and the human figure of Jesus. A symbol in this sense will always have a tangible (i.e., sensory-physical) aspect – colored patterns on cloth; a band of precious metal; a portrait in stone, wood, or paint; or the body and behavior of a living person. Who the historical Jesus was, what he said and did, and the effect he had on his contemporaries – some of whom felt arrested and transformed in his presence, others who conspired in his arrest and execution for rousing the rabble – are what the Gospel writers attempted to render in their mythological depictions of him. Again, they hadn’t actually been there, but they tried to capture his influence by placing their fictional subject within a constellation of mythological themes, heroic characters, and revealing episodes. Thus Jesus the symbol of God became the Second Adam, a New Moses, the son of David, Suffering Servant, Lamb of God, and Word-made-flesh. By wrapping Jesus into this web of myth, they attempted to re-present him to their contemporary audiences, labeling and linking him to ideas then current in the way people characterized the transcendent mystery or Spirit of God. Under none of those titles was Jesus understood to be equal with God in any straightforward sense (which is our working definition of idolatry). What we have in the early centuries of Christianity, then, is a progression – forward movement but not necessarily improvement – from the historical figure of Jesus, into the contemplation of Jesus as a symbol of God, and arriving finally in a theological orthodoxy that effectively ignores Jesus by making him God. The paradoxical tension of the second phase (New Testament mythology) has snapped, leaving us with a deity out of this world – but coming soon! – and a Jesus long gone and all but forgotten. 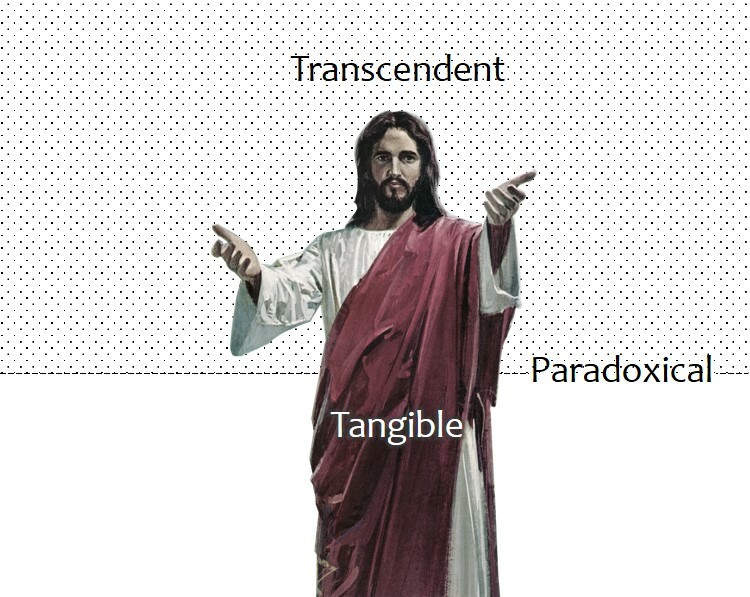 As my diagram shows, the second-phase storytellers inserted what we might call transitional mechanisms into their narratives in order to get Jesus out of the historical past and into their contemplative present (in the episode of his resurrection), and then later (with the ascension) into his identification with God. 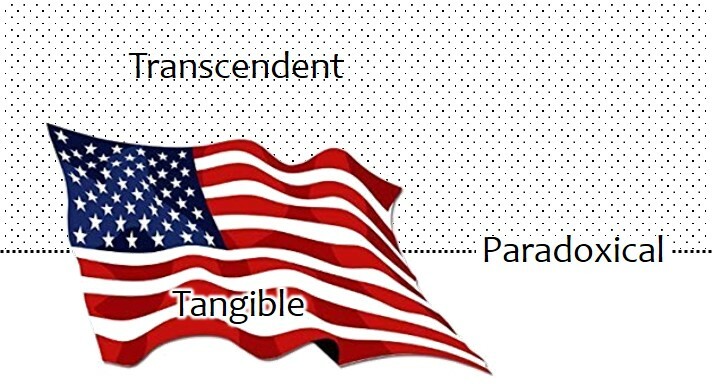 By rotating the diagram 90° to the left we thus have the phenomenology of symbol perfectly illustrated: the (once-) tangible Jesus of history, the symbol in whom both human and divine are paradoxically united, and the transcendent mystery beyond name and form – although theologians are famously reluctant to admit it. As a few early Christian theologians (particularly the so-called Cappadocian Fathers: Basil the Great, his brother Gregory of Nyssa, and their close friend Gregory of Nazianzus) were bending logic in their contemplation on Jesus as a symbol of God – “fully divine, fully human, neither separate nor confused” – the emperor Constantine was urging his new kingdom of bishops to make a decision for one side or the other. The council decided in favor of making Jesus into God. And now he is nowhere to be found.